CCP has created a wonderful PvP sandbox in EVE. Unfortunately, too many players abuse the sandbox by using their freedom to make bad decisions. There's good news, though: When players make bad decisions in highsec, they get punished for it by Code enforcers. Logically speaking, the Code was predestined to come into existence; highsec wouldn't make any sense otherwise. Let's take a look at the Code in action during the week of January 14th @ 00:00 EVEtime through January 20th @ 23:59 EVEtime. What will it take to teach all of these ORE cargo-expanded jump freighters to obey the Code? How many hundreds of billions of isk must be destroyed in the Iyen-Oursta system? 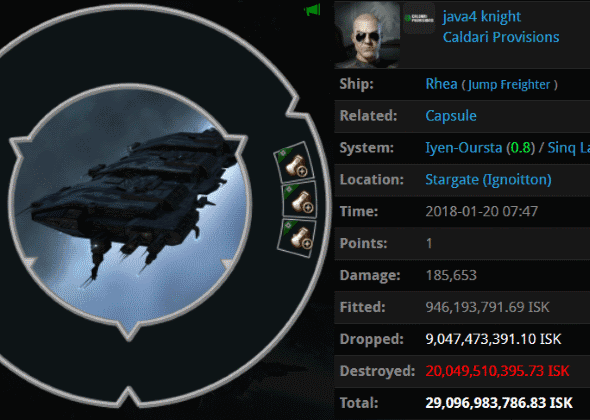 java4 knight was the latest to experience a crushing loss simply because he couldn't be bothered to buy a 10 million isk mining permit. An impressive gank fleet assembled by the mighty CODE. alliance took down this beast: Agents Tax Collector Alison, Tax Collector HongMei, Justin Kusion, Jayson Kusion, Jason Kusion, Tax Collector Kimi, Tax Collector Larry, Pod Destroyer Molly, Tax Collector Kittens, Australian Excellence, Jake Kusion, Taxman Daniel, Tax Collector Richard, Tax Collector Buck, Joseph Kusion, Joel Kusion, Jayden Kusion, Tax Collector BokChoy, Tax Collector Fuemi, Tax Collector Shardani, Tax Collector Max, Tax Collector Yuna, Tax Collector Stroheim, Joshua Kusion, Tax Collector Hill, Tax Collector KarlMarx, Tax Collector Aruka, Jackson Kusion, Tax Collector AynRand, Johnathan Kusion, Jeremiah Kusion, brainlet, Ding Dong MingMong, Mining Lord 1999, Kaddan, HSM Chief PettyOfficer, and HSM Fleet Admiral. A sample of the cargo reveals that somebody has been doing a lot of unlicensed mining. I wonder how many hours of "effort" were erased by this gank? It probably goes without saying that Jacht Mihoff's Retriever fit was ill-advised. 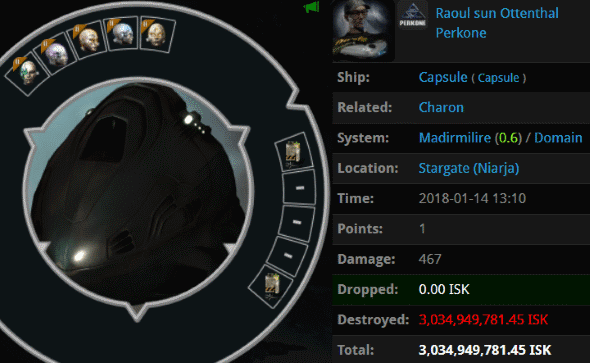 He managed to lose nearly 900 million isk on what would normally be a cheap barge. 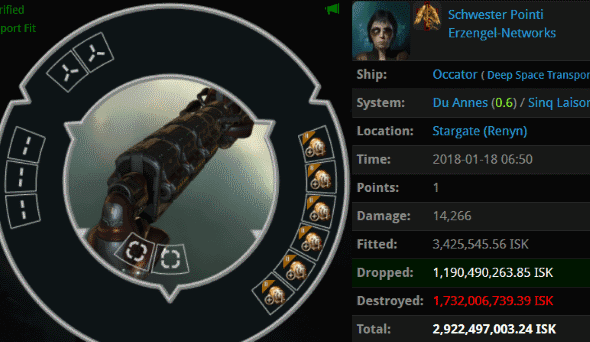 Jacht can't claim he was defenseless--he equipped a drone damage mod, after all. Even so, he was defeated in elite PvP by Agents Liek DarZ, Plasma Death, and Photon Death. I guess the theme of the week is, "A foolish miner and his money are soon parted." 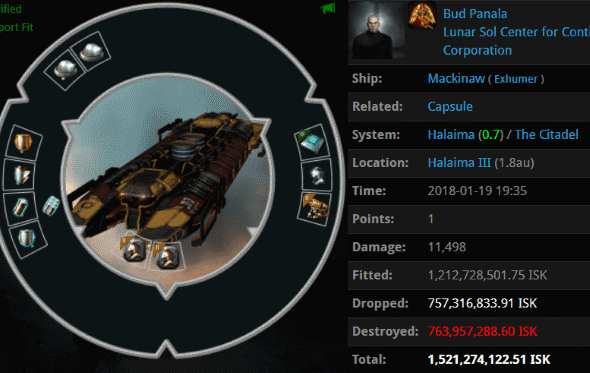 Bud Panala spent 1.5 billion isk on a head-scratcher of a Mackinaw. Even an unlicensed carebear ought to be able to design a better fit than this. Agents NotTheSmartestCookie, Lil Bobby Tables, Hans Ferdeappel, Snoobee Power, Nasagasa Bump, Lingmei White, xilaf, Hyrum Shakiel, Unfit ForDoody, flyper faper, Crom Cimmeria, Dixie Lot, and Space Pirate Gankus were all eager to get a piece of this killmail. 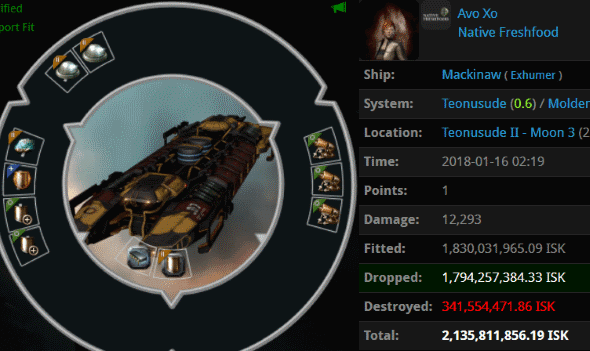 Over a billion isk of the loss came in the form of decadent mining drones. I'm sure plenty of bot-aspirants wish they could be a mining drone. Is it possible that the miners are actually getting dumber? Avo Xo offered new support for this theory with her 2 billion isk Mackinaw. Contrary to Avo's expectations, her billion isk invulnerability field didn't scare off Agents Cautiously Pessimistic, Lucia, Alt Proxy, Araena Calorne, Cautiously Optimistic, Erigeneia, Alt 00, Alt 0, and Eva Mavas. It's almost as if blingy modules make you more of a target. You can tell that Schwester Pointi was desperately afraid of being tackled. But all of that warp core strength did her little good while she slowly autopiloted through highsec. Agents Trump The King, Lagatha Rozei, Christine Rozei, Giselle Rozei, Tawny Rozei, Shanade Rozei, brainlet, Sherri Rozei, Ruby Rozei, and Ivanka Rozei knocked out the Occator and did highsec proud. 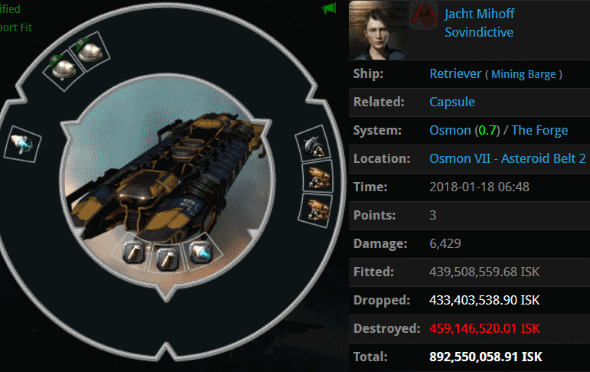 Schwester was carrying nearly a billion isk in skill injectors. That was only the start, though. The bot-aspirant was also smuggling a couple dozen BPCs that would've been used to create more decadent mining drones! zKillboard didn't value the BPCs, but let's just say highsec is a little more Code-compliant with Schwester and her cargo taken out of the equation. Raoul sun Ottenthal was ganked while autopiloting a 4.5 billion isk freighter. His humiliation was made complete with an additional 3 billion isk loss from implants popped by Agent Pod-Goo RepoWoman. Judging by his implants, Raoul was in a hurry. Not to worry, freighter pilots. We'll gank you even if you're late. carebears can sure find some silly ways to lose ISK. Highsec ag carebears don't seem very bright. I wonder why antiganking did nothing to stop these ganks? Do they even log in anymore? Should they continue to call themselves "antiganking" at this point? Maybe "high salt militia" would be more appropriate, they never seem to run out of that! So...Where was the high salt militia? Why didn't they use their strategic sodium reserves to stop these ganks? Why do they even "play" this game? God you guys are robots, where's wolf to preach about his shardani hero, his timing needs to be updated. James get your bots working right one of the little shits is late. Then theres galaxy pig with his "shitters" comments, and theres the homophobe who calls everyone "phags" did they break down r did you not recharge their batteries. Perhaps someone uploaded a virus to your robot army and now they are getting reprogrammed. Keep up the typical and predictable work there James your bot programs are as always repeating the same processes. You seem like a mad PHag hisec shitter, thanks for the tears little johnnie pedo. Im here. Just wanted to see someone sperg out in the comments about how they fail so hard. ag carebear spergs go on and on about how EVE is full of nothing but psychos and evil, then when you shoot a carebear (in a carebear shooting game mind you) they go batshit and make all kinds of RL threats on your family while spewing vulgarities that would make a sailor blush. Why do those types even play this game? "EVE is at it's core a pvp game" straight out of the official CCP new player FAQs. I'm willing to bet that if all the highsec miners left tomorrow, nothing would change except the quality of the community, for the better. All you highsec miners need to do to prove me wrong is quit, and wait for us to beg you to come back. Why do they call them anti-gankers if they never stop a gank? Come on professor L Lawton surely someone as knowledgeable as yourself can come up with an explanation in regards to this most pressing question. ag is lying about those 2 saves also. If something survives a gank attempt it is because the gank FC decided to let it live with a warning. You give a carebear a reprieve and all you get in return is a bunch of spergy shitters claiming they saved "something", most of the time they don't even know what the gankers are sheioting at. And we should stop calling them " antigankers", it's already been proven that they don't actually physically "anti-gank", they mostly just whine and cry and make TOS breaking threats against normal players. We should just be calling them what they really are: Scared Hiding Intimidated Tearfull Tactless Emotional Retards, or shitters for short. So why didn't the SHITTERs stop the ganks? He might be the first ag to actually get a real kill. But i think he realised when ganking, how he has been doing it wrong, and is feeling so nauseous that aligning with ag has ruined his life. No shower can wash the ag from his soul. Never forget the rl child murderer shardani. These folks need to stop buying drugs at jita. O wow, that is some retarded miners. Gold painted cane toads still stick to the wheels of the truck that runs them over.